Our group is part of the Intelligent Sensor-Actuator-Systems (ISAS) Laboratory. We are interested in data fusion for networked multisensor systems including distributed and decentralized state estimation, Kalman filtering with event-based and asynchronous communication, and state estimation for large-scale systems. Geometry with two aircraft and five sensors. 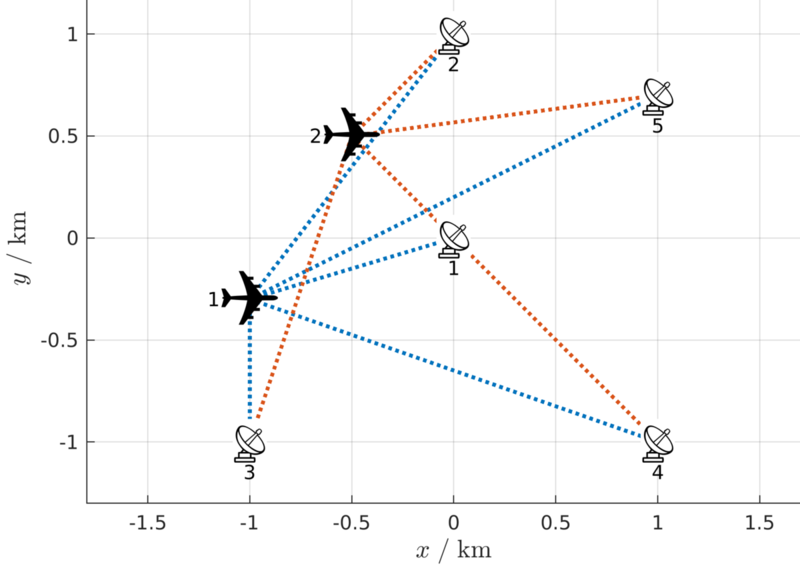 Signal propagation times are proportional to the euclidean distance between aircraft and sensors. Timing diagram with two aircraft and five sensors, showing how the signal arrival times are formed. Multilateration is a technique to estimate the position of a transmitter of propagating waves based on measurements taken from sensors at different distant positions. It is applied in radar, sonar, and radio astronomy, for example [TDOA_FKIE]. 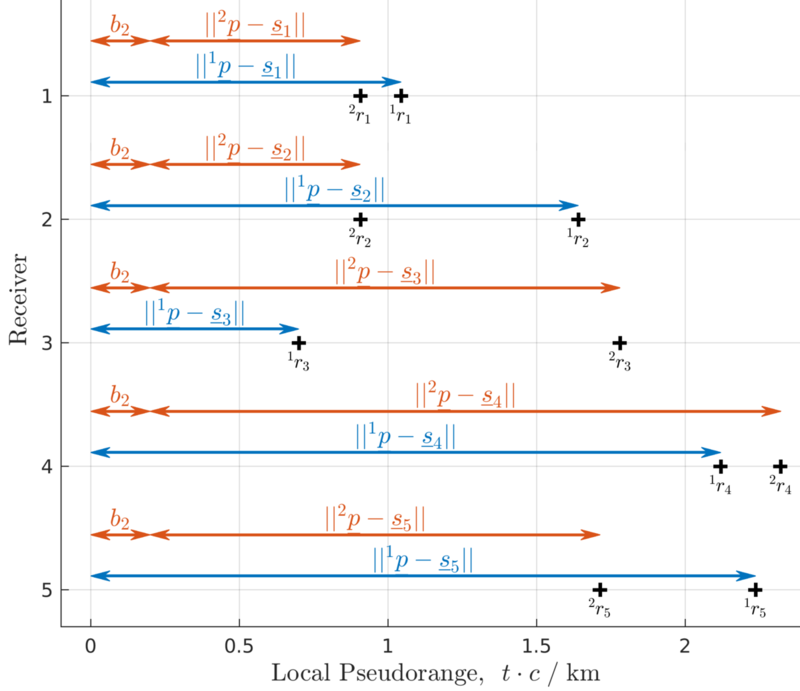 We set up the measurement equation that calculates the time of arrival (TOA) of the signal at a given sensor based on its distance to the source and the propagation velocity. When enough measurements are available, only one aircraft position can reproduce the encountered TOA. Sometimes we work with time differences of arrival (TDOA) which can be calculated via cross correlation of the sampled input signal. Current research at our institute covers multi target tracking [SPIE17_Hanebeck] and multi sensor data fusion [Fusion18_Radtke]. We estimate aircraft positions in datasets from our cooperation partner Frequentis Comsoft in Durlach. We develop advanced techniques to localize aircraft also in cases where it is problematic at present, like sensors with non-synchronized clocks, for example due to GPS breakdown, and when more than one aircraft send indistinguishable messages. At ISAS, we also apply multilateration to localize sound sources in experiments at the institute. With multiple directional sensors, we want to bridge multilateration and directional statistics [Fusion18_Li-SE2]. With new distributed information fusion algorithms, we want to merge measurements from multiple sensor nodes.